The Front Pocket Holster by Stoner Holsters is designed to allow you to carry concealed in your front pocket. 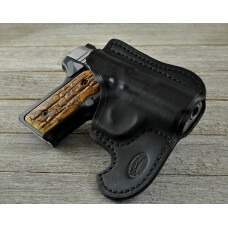 Each holster is custom made for your gun's specific make, model, and barrel length. This holster is ambidextrous, so it may be worn in either pocket. When drawing this holster, you should utilize the "hook" to ensure your holster does not leave your pocket when drawing. Simply drag the hook up the edge of your pocket to use this correctly. The hook will grab the material of your pocket, preventing it from coming out of your pocket with your gun. Available Soft Side Out option for additional friction inside of the pocket. All Soft Side Out holster must be manufactured.